A pump is a mechanical device, usually powered by an electric motor, which causes hydraulic flow and pressure for the purpose of filtration, heating and circulation of pool and spa water. 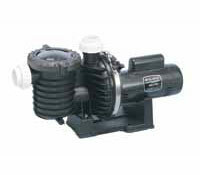 Typically, a centrifugal pump is used for pools, spas and hot tubs. Pump Strainer Basket - A device placed on the suction side of the pump, which contains a removable strainer basket designed to trap debris in the water flow without causing much flow restriction. Sometimes called a "hair-and-lint trap."